Come in for one to three sessions with Tracy and receive $50.00 off the first two and $25.00 off the third. 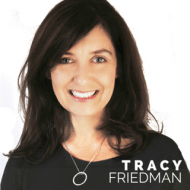 Tracy completed a Master of Social Work from the University of Toronto and subsequently received her Doctorate of Education from Nova SouthEastern University with a specialization in children and youth. She completed two intensive clinical internships specializing in children and families and adult mental health at The Hospital For Sick Children and Mount Sinai Hospital. Tracy has extensive experience working with children and families in transition. She has worked in hospitals, community agencies and school settings and is deeply invested in working with parents to provide support to their children during the separation or divorce process. Tracy has lectured at both the college and university level and she currently sits on the board of Access for Parents and Children (APCO). Building a Rainbow: Mindfulness and Menchies is a unique children's and parent group that focuses specifically on finding calm during stressful times. The group teaches young participants to build their resilience no matter what is going on using breadth, movement and creative art activities. Children are supported to share their learning with their parents during the last 15 minutes of every class. The group runs as a drop in and new members are welcome at any time. Contemplating a change in a relationship can be incredibly overwhelming. It is normal to experience emotional, physical and at times psychological upset. Tracy works with children and families who are experiencing transition in their lives. She helps clients understand that these feelings are unique to each individual and well deserving of attention, compassion and care. She is deeply invested in understanding and supporting individual and family stories. Tracy believes that each individual's assessment of their situation is unique. Therapist fit is her priority for her clients. Connection is the most important component in her work and she takes incredible pride in making her client’s experience meaningful, productive and safe. Tracy offers individual, family and group therapy in the areas of Separation and Divorce, Parenting, Mindfulness and Resilience Training.